Well, that’s a first. Amazon released the first smart speaker, the Echo, on November 6, 2014. Google released its competing product, Google Home, two years later. Since then, Amazon has consistently sold more smart speakers than anybody—that is, until the first quarter of this year. According to a new Canalys report, Google shipped 3.2 million Google Home devices in Q1, while Amazon shipped only 2.5 million Echo devices. The various devices made available by the two companies aren’t so different in size and price. But the digital assistants inside them are quite different. Amazon’s Alexa assistant has a wide variety of third-party skills and a bent toward online shopping. Google’s Assistant is stronger on productivity assistance and search-related requests. 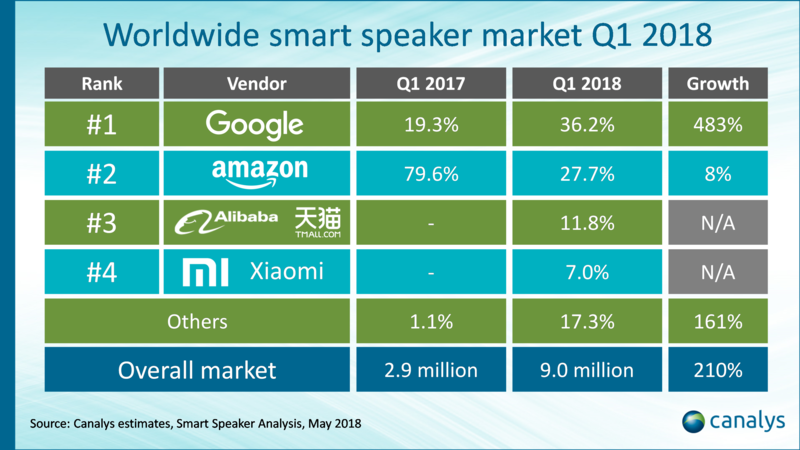 Canalys says smart speaker makers shipped 9 million devices worldwide in the first quarter of 2018, a growth of 210% over last year’s first quarter.